Who is going to play SS for the Mets? Well, it’s almost March and it appears the Mets are unsure of who their opening day short stop will be. 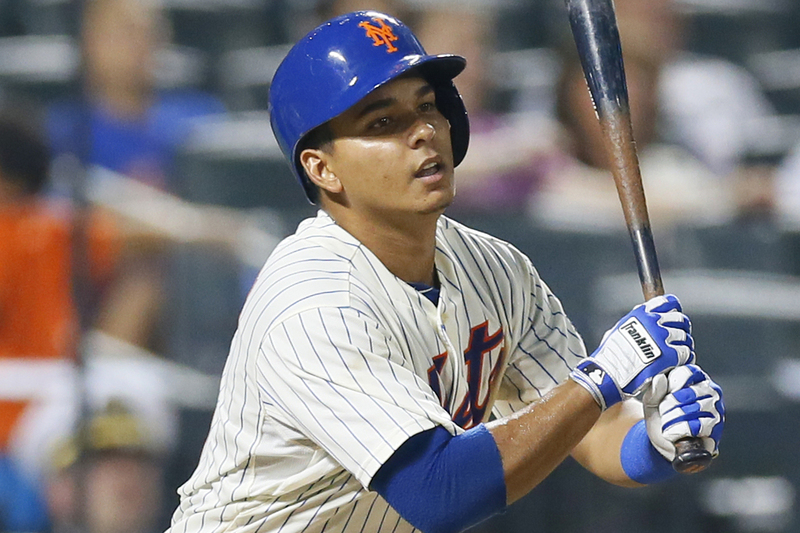 Ruben Tejada was the “penciled in” candidate for the job, but reports have begun to surface that the Mets are once again disappointed in him, leaving the position in question once again. Besides just the Tejada reports, we also have news that Wilmer Flores will spend time this spring back at his original position. Then there is Stephen Drew, who is still available and has been mentioned as a Mets target for months. More recently, we have the Seattle Mariners shopping Nick Franklin, who has also become a potential candidate via trade. The 24-years-old was/is the favorite to win the job. When the Mets allowed Jose Reyes to leave in free agency, it was believed that they had his replacement already in Tejada. Initially it looked like they might have been right. In 2012, he hit .289 with a .333 OBP while playing a solid short stop at just 22-years-old. But things quickly began to change in 2013. Tejada showed up to camp late (Not entirely true, but he wasn’t early) and out of shape. Things got worse from there, he was plagued by injuries and put up a .202 avg/.259 OBP/0 HR/10 RBI in just 57 games. This is what ultimately led the Mets to send Tejada to their off-season conditioning program, where he has since returned to mixed results. Although the club appears to be unhappy with him, until a viable option is brought in, this is clearly still his job to lose. I’m not sure if he deserves all of these opportunities, but if Tejada does end up losing this position, he has no one to blame but himself. This could be his last chance to be an everyday player with the Mets, I would live to see him revert back to the promise he showed in 2012, if not, Tejada could be looking at a future as a utility infielder. Then there’s the mystery of Stephen Drew. No one seems to be able to pin point exactly he is asking for. He clearly made a mistake in turning down the $14 million qualifying offer from the Red Sox. Because of that offer, a team would have to sacrifice a draft pick in exchange for signing him. In the Mets case, that would mean a third round pick (First pick is protected and second was given up in exchange for Granderson). There doesn’t exactly sound to be teams bidding on Drew and the Mets are really the only team you hear that has showed continued interest. I know the majority of fans have been screaming to just sign Drew and get it over with already. I don’t think they are wrong, but I want it to be at our price. Drew is a proven player, at this point in his career, we have a good idea what it is we would be getting out of him. He is a good defensive player with a good bat for the position. The 30-year-old, soon to be 31, produced a season of .253 avg/.333 OBP/13 HR/67 RBI last season. Those are certainly upgrades from the production we have been getting since the Reyes departure, no doubt about it. The biggest concern I have is Drew’s health. He has only played over 100 games once since 2010 and that was last season at only 124. That would make me weary about any sort of lengthy deal. If drew would sign for a 1-year or 2-year $20 million kind of deal, than I would say go for it. Anything more than 2 and I’m out. I know some people like to hold on to draft picks for dear life, but it is a third round pick and the draft is always a crap shoot after all. Drew would bring instant credibility to the position, but don’t look at him as the savior. IF the Mets do bring him in, are they serious contenders to win the division? Probably not. But he does solidify this team more than where it stands today. Flores is an interesting case, whose name has only come up for this job in the past few weeks. Like Tejada, Flores was sent to the off-season conditioning program. But, unlike Tejada, the Mets seem rather pleased with his results. The claim is that Flores is in the best shape of his life, quicker and more agile than he has ever been before. The 22-years-old came into the Mets farm system as a short stop, but was later moved due to his inability to play the position. He has spent most his time playing second and third base. His offense is what has made him a touted prospect in the organization. In 107 games at AAA he posted a .321 avg/.357 OBP/ 15 HR/86 RBI, although he didn’t fair quite as well when he was promoted to the majors. In 27 games he hit only .211 with 1 HR and 13 RBI, all while playing third base. There is no question that Flores is a better offensive option compared to Tejada, the only concern with him is his defense. Can a man who was known to have no real position the last few years suddenly emerge as a real candidate to play SS in the majors? It’s hard for me to imagine him being a serviceable defender to justify giving him the job. He has always looked stiff in the field and doesn’t appear to be athletic enough to handle this role. But, if he really shows he can hold his own, and at least make the plays he is supposed to, I would like to see him given a real chance. We know at this point he will never play third base for this team, second base is blocked by Daniel Murphy, for now, and first base, who knows? Let’s wait and see how he looks this spring, he certainly would be a nice surprise if he could somehow earn the job. Franklin’s named has come up with the news that the Mariners are shopping around the 22, soon to be 23-year-old. He was considered one of the Mariner’s top prospect over the last few seasons but has been squeezed out with the emergence of Brad Miller at SS and the signing of Robinson Cano to play second base. In his rookie campaign, his stat line read .225 avg/.303 OBP/12 HR/45 RBI. While those numbers don’t exactly scream wow, he was just a rookie. Franklin has been known to have some pop in his bat but questions remain as to whether he should be playing short stop or second base. Last year he spent the majority of his time at second, but in the minors he has played 261 games at SS compared to 122 at 2B. I do like that Franklin is young, leaving it unknown as to what his ceiling could be. Hitting 12 HR and 45 RBI in only 103 games last season is respectable for a middle infielder in his first season. If the Mets think he is capable of playing short stop, then he is worth seriously looking into. But, I wouldn’t trade one of our pitching prospects for him either. I understand you have to give to get in this game, but the Mets have spent the last few years stacking up their chips and I am not sold that he is worth one of our valuable pieces. Eventually some of our prospects will have to go, it’s a numbers game, but we should be saving our stockpile of arms to make that big splash somewhere down the line. If he is available for the right price, than I believe Sandy will jump on it, he has done quite well for us in his previous trades. Honestly, the only one that would really shock me to be the opening day SS on this list is Flores. However, anything is possible. If Stephen Drew drops his asking price, I believe the Mets will ultimately sign him. If not, I’m sure Sandy will explore all other options before giving Tejada another opportunity. And if Tejada does end up winning this job, he will be on a very, very short leash. Help Make Opening Day a National Holiday!